What is watercress? This time of the year we start making plans for our Easter celebrations. As Easter symbolizes it is also a time for rebirth; we see this demonstrated in all the flowers popping up all over and busting into beautiful blooms. The wild plants like dandelions that we find this time every year also means spring is here. I must say I never really knew much about what is watercress. Although I knew it was some kind of vegetable, I did not know any more than this; how it is grown or if it is wild. Now I know it is both; grown and grows wild. It was never in our diet when I was growing up and I have never come across it until recently. I don’t know if it grows wild in my part of Ohio like other spring vegetables do ; the dandelions, mushrooms and delicious tender asparagus. I am sure if it does Mom would have gathered it like she did the other ones but I don’t recall having ever eaten it when I was young. If Mom didn't gather it my Dad would have grown it like he did other things such as spinach, potatoes and beans. 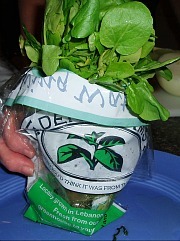 If you want to know what is watercress, ask around and see if it grows in your area. In a recent discussion with a friend, she was telling me how old some of her horses (one over thirty years) were and how great they still are doing. Our discussion went on to a pond in their pasture field and how the horses all love eating the watercress growing in the pond. I started to take notice to this vegetable. After this conversation, I began noticing this same vegetable growing throughout the Appalachian Mountains. As I take Enoch and Malachi on their hiking adventures, I see watercress growing in the creek waters. I love discovering things like this! Now I am gaining more interest in this vegetable so I decided to do more research on finding out just what is watercress. The first thing I discovered is that there are many health benefits of watercress. You might say this is a very amazing vegetable and probably why my friend’s horses are staying so healthy and living to very old ages. Watercress is a good source of beta carotene; a precursor of vitamin A and vitamin C. It is a useful source of calcium, iron, potassium and very rich in antioxidants which helps to prevent cancer and other diseases. I also read claims from people who accredit watercress for curing their cancer. A cup of watercress, containing less than five calories, carries many more claims by alternative practitioners for health benefits of watercress; none which have been proven but interesting. Some believe this vegetable relieves things like gastrointestinal upsets, respiratory problems and urinary tract infections. Others claim that it acts as a mild antidepressant, appetite stimulant and a diuretic. The way I look at it even though these claims have not been documented, why not add it to my diet like I use lettuce or other vegetables. 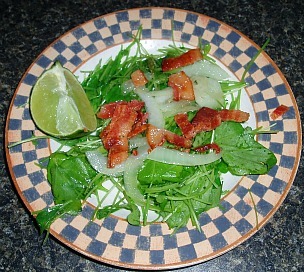 Now that I know what is watercress, I am so impressed with this great vegetable that I have already added it to my diet. I just have to decide where I will get it; from the wild or what store will sell it; then I will have to come up with some good recipes. After reading more about it, I have decided to purchase it rather than collecting from the wild for several reasons; the number one is that I really don’t know much about it and I feel purchasing it is safer. There are dangers from collecting from the wild. As I understand it, there is a copy watercress which usually grows next to the real thing and is similar in appearance; the “copy cat” is a POISONOUS PLANT. Another thing is that if growing in the wild it could contain parasites and some of the waters can contaminate the watercress especially if the water is still and not flowing water. If you do collect from the wild it is suggested to cut it from the tops and not from in the water. Preparation of the wild watercress takes longer to prepare to ensure it is safe to eat. It may be for these reasons that my mother never collected this vegetable if it is grown in Ohio. My suggestion is if you want to know what is watercress and try it, purchase it from a reputable distributor like I am doing. Know what is watercress when shopping; it is only sold fresh so you will find it in the produce section if the store carries it. Most likely it will be in bunches; usually it will be in plastic bags and when moisture is added in the bag, it will stay fresh and crispy. When purchasing this vegetable, look for crisp light green color leaves. Bypass any with wilted or yellowed leaves much the same as when you select lettuce for salads. This pungent member of the cabbage family is usually used as a garnish in salads and blends well with citrus; it can also be added to many cooked recipes. Many say they add it to juices. I suggested it to a friend who uses juices daily for a health regiment and he tried it. This is just a note of caution but he said it was extremely strong when squeezed so you may need to dilute it with other milder juices; it might go well mixed with orange juice. Combine butter, flour, watercress and bouillon; divide in portions and blend until smooth. Put mixture in saucepan and bring to a boil over medium heat while stirring. Reduce heat and add pepper and cream; heat until cream is hot. 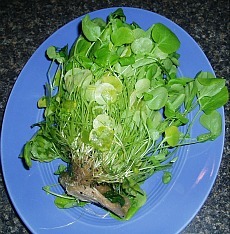 Garnish with toasted roll on top with sprig of watercress. Chop watercress fine; sauté in 2 tablespoons melted butter. Add chicken bouillon and boil 5 minutes. Combine 1 tablespoon with flour; stir flour mixture and beaten egg yolk into cream until smooth. Stir creamed mixture into sautéed watercress until hot and blended; season with salt and pepper. STEAK GARNISH (or topper) This is a great way to top those delicious succulent steaks when you know what is watercress. Drain 3 tablespoons green peppercorns; add to the skillet in which you cooked the steaks. Add sprig of watercress and sauté a couple of minutes; spoon over steak serving.Cook 4 slices bacon until crisp; drain excess fat. Crumble bacon back in pan and toss with pieces of watercress over medium heat; spoon on steaks. When learning what is watercress, it is best not to eat wild watercress especially when not cooked because it could be contaminated. When preparing watercress for salads wash, remove the roots, drain and chill. Arrange in a salad dish or bowl and it can be served like this with dressing (French dressing is good). You can also add other vegetables like cucumbers; mild ones go best since watercress has its own strong flavor. 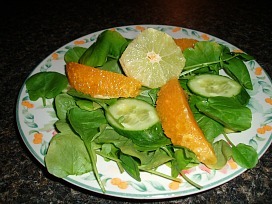 Try segments of citrus fruit in the salad; they blend well. What is watercress and can it be used for salad? Yes watercress makes a tasty and very healthy salad like the recipe below. Discard tough pieces of watercress; place leaves and small sprigs in a bowl. Tear lettuce leaves in to bite size pieces and add to watercress. Top with small thinly sliced onion and pour dressing over the top. Combine ¼ cup olive oil, 2 tablespoons lime juice, ¼ teaspoon sugar, ½ teaspoon ground cumin, ½ teaspoon salt and 1 clove minced garlic in a small jar with lid; shake before using. Combine all ingredients and shake well or beat until thoroughly mixed; chill. 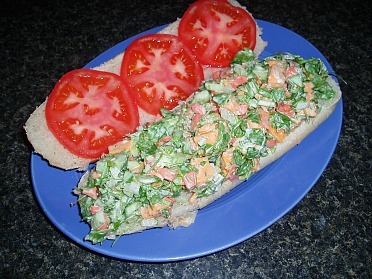 Now that you have learned what is watercress, you will surely want to try it on sandwiches. Shred, grate or slice other vegetables like carrots, cabbage, celery, cucumbers and onions. Combine any of these or a combination with finely chopped watercress and marinate them in French dressing or a heavier dressing. If desired crumble some crisply fried bacon in the vegetable mixture, add some chopped tomato or some grated cheese. Slice a thin loaf of French bread in half lengthwise, spread each side with softened butter and then stuff the sandwich with the vegetable mixture; cut loaf in serving size. Squared sandwich loaves of bread make a very nice presentation for this special vegetable; so much that your guests will be asking what is watercress. Remove the crusts from an unsliced loaf and cut it lengthwise into ½ to ¾ inch thick. Butter lightly on all sides with softened butter. Spread bottom slice with a filling and top it with another slice; continue in same fashion until loaf is assembled. Whip in mixer 8 ounces softened cream cheese and a little cream until spreading consistency. Frost top and sides like you would a cake; chill until frosting is firm. Cut in thick slices to serve. You can use a variety of fillings; one layer watercress salad (as above) or just chop watercress finely, add pickle relish and mayonnaise, layer of ham salad, layer of egg salad, etc. Here are a couple more sandwich ideas. Remove crusts from bread and slice in ¼ inch slices. Spread each slice with softened butter. Make a mixture of finely chopped watercress, crumbled crisp bacon and mayonnaise; spread on slice and roll up jelly roll style. Stick roll with pretty toothpicks, cover and chill until serving. Another mixture which has great flavor is mixing 1 cup finely chopped washed and thoroughly dried watercress, 3 tablespoons softened cream cheese, ½ teaspoon Worcestershire sauce and 1 tablespoon French dressing. Use this for any type of sandwiches.